Finding the location of the 54th New York Infantry monument is half the battle. Along Gettysburg’s winding Howard Avenue, you pass monuments that mark the actions of military units such as the 107th Ohio Infantry and the 58th New York Infantry. The monuments sit so close to the road that you don’t even have to leave the comfort of an air-conditioned car to read the inscriptions on the stone blocks. At the crest of the road, a cluster of monuments, statues, cannon, and a flagpole mark the events that took place in July 1863 on Barlow Knoll. From that crest, you can look northeast down the slope of Barlow Knoll to the tree line along Rock Creek. Within those trees is what is arguably the least-visited monument on the Gettysburg Battlefield. Although there are no visitor statistics for monuments, this monument is so isolated that you have to know what you are looking for in order to find it. There is no road to pull up alongside a tall, sculpted statue. There is no trail graded and well-marked that you can stroll along. You won’t even find a sign for directions to marker. “You could definitely make a case that it’s the least visited marker,” says Katie Lawhon with the National Park Service. The 54th New York Infantry recruited primarily Germans from Brooklyn and New York City who were mustered into the serve near Hudson City, N.J., between Sept. 5 and Oct. 16, 1861. The unit also received one company of the McClellan Infantry. From New Jersey, the unit served near Washington, D.C., until April 1862. It was then sent into Virginia under the command of Gen. Fremont. The 54th fought in the Battle of Cross Keys and in the Chancellorsville Campaign, according to “The Union Army: A History of Military Affairs in the Loyal States, 1861-65—Records of the Regiments in the Union Army—Cyclopedia of Battles—Memoirs of Commanders and Soldiers. At Gettysburg, the 54th New York was commanded at the Battle of Gettysburg by Maj. Stephen Kovacs, although he was captured on July 1. The unit was attached to the 1st Brigade, 1st Division, 11th Corps of the Army of the Potomac. 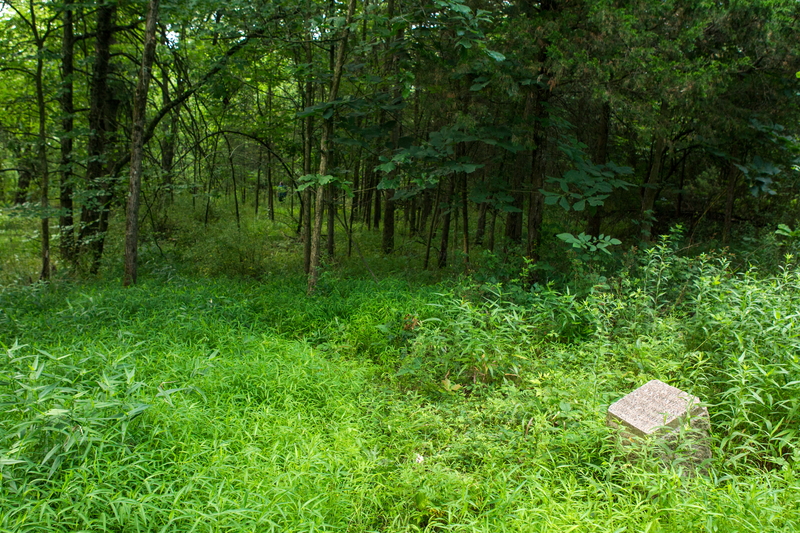 The granite stone below Barlow Knoll is an advance marker that indicates where a detachment of soldiers was placed on the south side of Rock Creek to delay the enemy if they could. The New Yorkers engaged John Brown Gordon’s Brigade from Georgia, according to the Gettysburg Daily website. The Georgians did eventually push the Union men back, though, and the 54th New York detachment retreated to join up with its larger command. Contrast this small marker to the much larger monument to the 54th New York that is southeast of Gettysburg on Wainwright Avenue (and easily seen from the road). This monument to “Hiram Barney Rifles” depicts Heinrich Michel in bas-relief (a type of sculpture where the figures project slightly out from the background.) He was killed carrying the company colors on July 2, 1863, the day following the detachment’s actions near Barlow Knoll. During the fighting here, Lt. Ernst Both was in command, since Maj. Kovacs was a Confederate prisoner. Of the 216 soldiers of the 54th New York Infantry who took the field at Gettysburg, seven were killed, 47 wounded, and 48 went missing. Following the Battle of Gettysburg, the 54th New York Infantry camped near Hagerstown, Md., until August when it was sent to Charleston Harbor in South Carolina. It was stationed on Folly Island and took part in the siege of Fort Wagner and the bombardment of Fort Sumter. During the summer of 1864, the unit fought on James Island where 20 men were lost. It remained in the Charleston area until the men were mustered out on April 14, 1866. Getting to the monument itself is a battle. From the top of Barlow Knoll, you walk downhill to the trees about 100 yards away. This is no easy feat if you have to tramp through the grass when it is waist high. had a path to it, but it was moved,” Lawhon says. grass that surrounds it, but there it sits, visited probably less than a handful of times each year because you have to know where you’re going in order to find it. Even knowing where it’s located, you could pass within feet of it, never realizing that one of Gettysburg’s 1,328 monuments sits in such an isolated, inaccessible location. Returning to your car from the marker is even a greater chore. You must wade through about 100 yards of grass and brush just to get out of the trees. Then, you have to climb Barlow Knoll. This can be quite a challenge if the tall grass is bent toward you like pikemen with their pikes lowered to meet an enemy charge. Because the grass was waist high to start, it now reaches your stomach and chest because of the incline. Lawhon points out that whether or not the slope is mowed depends on the time of year and what crops might be grown nearby. The 54th New York Infantry advance marker isn’t the only out-of-the-way marker. Not all of the fighting during the Civil War battle took place in locations where it is feasible to have a road. Here are some other monuments on the battlefield that don’t see many visitors because of their isolated locations.